Brown tabby, seal lynx point, seal sepia tabby/seal mink tabby. Length short to medium; texture thick, luxurious, and unusually soft to the touch. 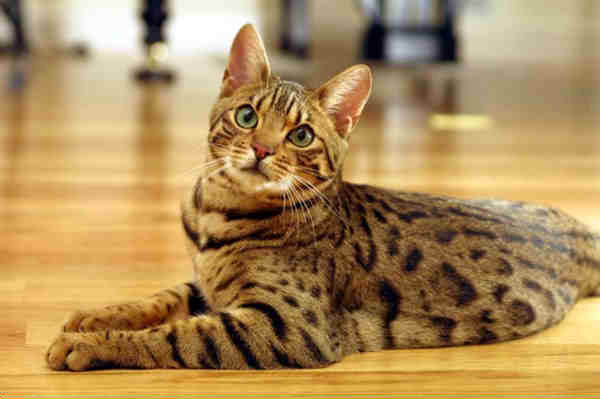 The Bengal’s most distinctive feature is its spotted or marbled coat. The spots or marbling, which may be black, charcoal, cocoa, rust, or chocolate brown, are aligned horizontally or randomly spaced over a white, creamy, or orange-tan background. With their short fur, Bengals require little grooming. Bengals have small, rounded, wide-spaced ears and large oval eyes, much like many wild feline species. Their coats are sleek, and their overall appearance is that of a beautiful small wild cat. The Bengal may look like a wild cat, but breeders insist that the Bengal is as lovably friendly and docile as any full-blooded domestic cat. Fanciers describe Bengals as playful, gregarious, and energetic cats that have a generous dose of feline curiosity and that want to be involved with their owners. Not intimidated by water, they will sometimes join their owners for a swim, as long as it?s on their terms. The Bengal is easy to care for; just a brief combing once a week to remove dead hairs will keep Tiger looking terrific.